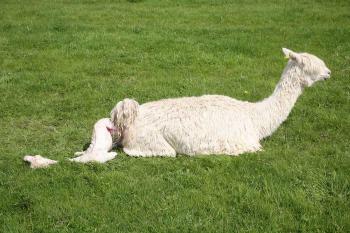 With alpaca birthing, the alpaca’s gestation period averages 11.5 months, but may vary from 11 to 12 months. 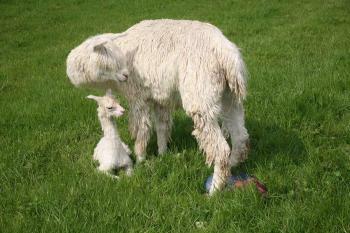 Any cria born earlier could well need extra help. We tend to bring our heavily pregnant females close to our house for regular observation six weeks before the 11.5 month due date. Alpacas are generally born between 7am and 3pm and if born later, it is important to make sure the cria is dry before nightfall (and bring it – and mum – into a shelter, if necessary). The vast majority of crias are born, get up, and feed on their own – without any assistance. 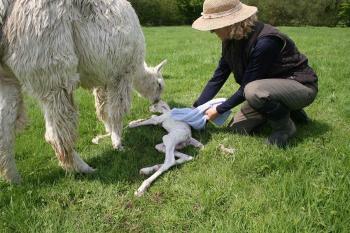 However as their mothers do not dry them off at all, we suggest you dry the cria with a clean towel, especially if it is cold or wet (shelter may be necessary – especially early in the year – and you may need to consider fitting a cria coat). 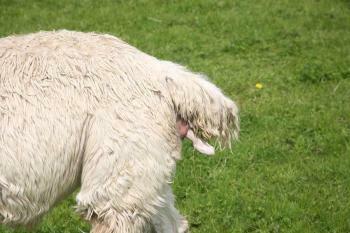 If the cria has any blood on it, it should be cleaned off. 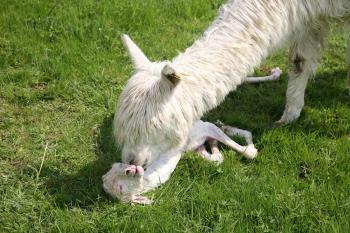 Check that the cria’s airways (nose and mouth) are clear. We dip the umbilical cord with Iodine (10% Iodine) to prevent infection and repel flies. It is important not to forget mum – check for any blood on her legs/ tail – and wash off, again so as not too attract flies. Mum should pass the afterbirth in the couple of hours following the birth, and it should be removed and disposed of. The mother’s milk does not tend to flow until the afterbirth has been passed so it is very important to make sure this has occured. Call the vet if after 4 – 6 hours this has not happened. 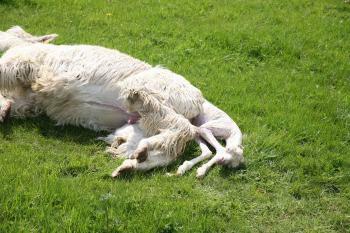 The next few pictures show a textbook birth here at Spring Farm on the 7th May 2006 – by way of an example. 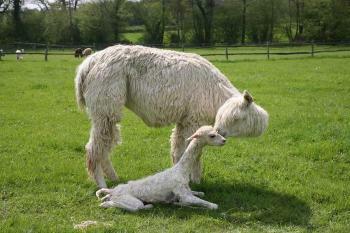 Garlic, the cria, was born without any problems – and both he and Chrissie (his mum) are doing very well – see last picture! 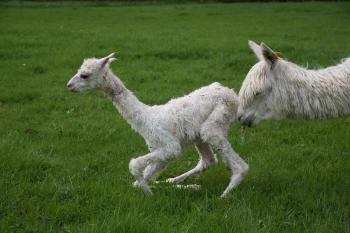 However, if you are in any way unsure as to your birth, you should seek advice or call the vet. The time it takes for a female to give birth may vary. The example above was for a female suri who has given birth before. 10% Iodine (to dip the navel) or an antiseptic spray. Bottle of dried colostrum/ frozen colostrum from your own herd. Lamb teet – to put on top of colostrum bottle (please make sure it fits before you need it). 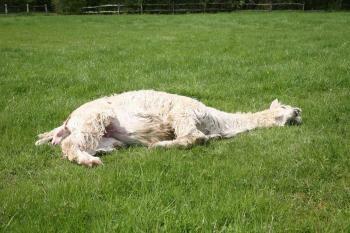 Towel – to dry cria – ensure it is clean. Navel clip – in case of bleeding from umbilical. 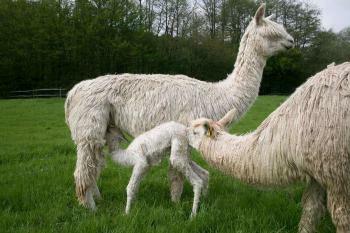 Cria coat – in case of being cold. 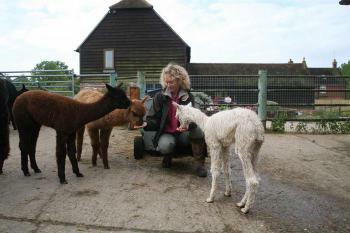 In the unlikely event of having to bottle feed a cria, you will need a bottle that you can sterilise and use regularly plus lamb teet. For milk, you can use goats milk from a carton (can be kept in the freezer until needed), either for the short or long term. We would use powdered milk replacer for long term bottle feeding. Please contact us for details. Do remember this can only be a brief guide – there is far more information that can be found in books on this subject.